I was somewhat concerned by the state of the New England Patriots defensive line after the team released both Marcus Stroud and Ty Warren last week. With Albert Haynesworth still on the sidelines—and my skepticism in general—the Patriots looked to be entering the season with the same line from last year, which wasn't up to the required standard. Ellis' addition is a masterstroke from Bill Belichick as not only is he adding a fantastic end against both the run and the pass, he was also the Jets best lineman last year. He may be at the tail end of his career but has shown no signs of slacking in recent years. 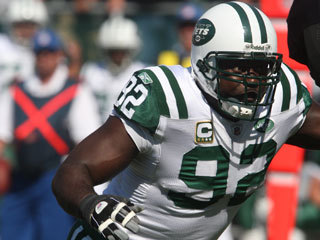 The Jets could not re-sign Ellis because of cap issues as well as the drafting of some rookies on the line. Their loss will not only hurt the Jets, it gives the Patriots exactly what they need. While Albert Haynesworth has a reputation for being a dominant pass rusher that was as a 4-3 lineman, Ellis is one of the best 3-4 pass rushers in the whole league. He is a proven player in a system that the Patriots favor play to perfection. Ellis is not a massively celebrated player but he fits the system better and is closer to a typical Belichick signing rather than any other of his signings this offseason.